Want to be an Image Consultant? Do your friends come to you for advice when they need to get their look just right for an interview, a night out with friends, or when they're going out on a date? If your answers to these questions are ‘yes, yes, and yes!’ then you should register for our Diploma in Image Consulting course. Then you could earn a living from doing what you love and what you're good at. You've probably seen image consultants on TV transform the looks of people who struggle when it comes to dressing themselves suitably. You've seen the positive impact that a new image can have on people. And you've seen that there is a demand for image consultants that can make a person's outer body reflect their beauty inside. Good or bad, society these days focuses heavily on appearance. So many people get left behind because they have little or no idea of what they should wear. And when they continually struggle to dress right, they give up and don't care anymore, resulting in knock backs and damaged self-confidence. That's why they need help from lucky people like you who have a natural flair for colours, shape, and most importantly fashion. You can transform them from a blur in the background to a walking masterpiece. Do I have what it takes to become an image consultant? Are you prepared to work through the good times as well as the bad times to help your clients improve their image? It won’t be as easy as taking a quick trip into the local department store and abracadabra a new person is born. Instead you’ll often have to work hard to build your clients’ confidence and self-worth. Stay positive though… Remember, you’ll be going shopping for a living! You’ll have your finger on the pulse when it comes to new fashions and trends. And you’ll know that you’ve helped your clients work towards the lifestyle and image that they’ve always wanted. It’s your job to live by example. You’ll have to be motivated to look great each and everyday. Are you prepared to take up this new and exciting challenge? There are many different reasons why potential clients might need an image consultant. They could want to have a more professional image because they've got a new job. Alternatively, they could be going for an interview and need some style advice to help them progress in their career. They might want to find a partner, and don't have enough confidence in their appearance to approach the person of their dreams. Their friends might be constantly telling them to make more effort, but they just don't know what suits them. They might be stuck in the past and unable to dress their age. There are so many different fashion disasters out there. You've seen them for yourself! You can help these people and earn a living at the same time. Our Diploma in Image Consulting course can teach you how to market your business so that these potential clients know how to contact you and use your services. Within a short amount of time your diary could be chock full of people desperate for your valuable opinion. Why do I need to study an image consultancy course? I already know about fashion. You might already know how to dress well, but this doesn't necessarily mean you know how to persuade people to change their ways. You might know what colours suit weight, height, hair colour and skin tone etc, but you need to have a broad range of styles in your mind to be able to meet the image needs of each of your clients. They're all individuals with different needs, wants and problems. Additionally, you'll need to know how to create a plan for the client's integration of their new look. They'll need easing in so that they get used to their new way of life and know how to go out and buy the right things. Your job's not complete until you can safely say you've put the client back on track to leading a happier existence. The course will teach you how to do this and more. You'll learn how to conduct your first meeting with your client. You'll know how long to make it last, what to charge and how to plan for the follow-up meetings. I wanted to take the opportunity to thank the whole team at the Blackford Centre for their professionalism and assistance throughout the course. I also wanted to advise you that my tutor has been not only an invaluable source of advice, support and guidance, but was truly outstanding when it came to marking my assignments quickly and providing positive and constructive feedback which assisted me no end throughout my studies. You'll identify what your clients should keep in their wardrobe and, more importantly, what they should get rid of. 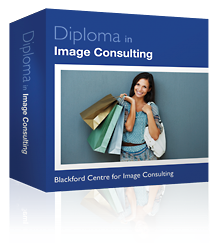 The Diploma in Image Consulting is different from other distance learning courses. It's written especially for people who want to run their own business. People who like to take command of their own destiny and who want to reap the rewards of running the show. 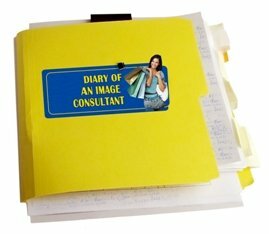 You'll find out how to set up your image consulting business. 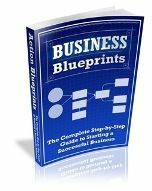 You need to know about tax, business costs and creating a business plan. Plus, you'll learn how to market your services so that you capture the interest of the wide variety of potential clients that are shouting out for people like you to make a positive difference to their life. Follow the highs and lows of a professional image consultant's life, as our self-employed image consultant reports each week on her experiences in the field. You’ll receive a free website for your image consulting business. 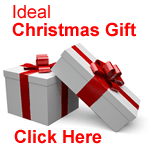 The site comes in a range of five colours, complete with sample text. It will save you a lot of money, weeks of delay and the trial and error that comes with designing a website. For more information, click here to see the free image consultant's website. The best way to learn is from a professional. And with our distance learning course you'll be able to contact your tutor, a practising image consultant. They'll have experience in the field and will be able to answer your questions. Everyone's got an opinion on fashion. Some people know their stuff, some people so obviously do not! You just have to watch an episode of TV programmes like 'Gok's Fashion Fix' to see that there are so many people in need the help of an image consultant. It's not a passing trend, fashion will always play a part in our lives. Fashions change daily, so those without their finger on the pulse need regular advice from those in the know. People of all ages are looking to improve their image - from late teens to early thirties, older single parents, to people suffering a mid life crisis. Every age group's got people struggling to find a look that suits them. There is limitless demand for a person with the right skills. And that person could be you. Many of your future clients won't just have issues when it comes to picking the right clothes off the fashion rails. They'll probably also lack confidence in themselves and their appearance. How else do you think they got themselves into this mess? It will be part of your job to help them take pride in their appearance and to get them to believe in themselves. This is where your people skills really come into play. You'll have to work on each and every client to make sure they have strong belief in themselves and the way they look. You can motivate them to see that they do look good as long as they wear the right clothes. So register now to get on course to becoming a professional image consultant. Most of my good news has occurred as a direct result of my press release, which was in the Bristol Evening Post. It also appeared here and here. More recently and again as a direct result of my press release, I was contacted by BBC Radio Bristol and asked to do a radio interview with Graham Torrington, which I did on Friday 8th August. This prompted a substantial increase in the number of hits I got on my website. Further to this, I have been asked if I would be interested in taking part in a 'Loose Women' style programme that BBC Radio Bristol are thinking of doing in the future! And of course I said I would be very interested indeed! Since I graduated, I worked freelance as an Image Consultant successfully, concentrating on the personal shopper, wedding make up and wardrobe wedding aspect of my trade. Then, due to a down-turn in the market and consequent recession, I was offered a job as Manager and head buyer for a designer Ladieswear boutique. I have worked there for just under two years and now am the Official Personal Shopper for Hitchin and am opening my own boutique in the same town. I use my skills daily and have a regular stream of ladies that require my assistance. I aim to combine the two trades and hold style evenings, style and shape direction and trend talks within my store. 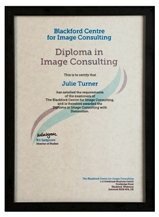 What does the image consulting course cost? Many students take nine months to complete the course. If you're busy, it could take you eighteen months. If you have spare time and you're prepared to work hard, you could complete the course in three months. But unlike other organisations, we set no time limit. You can take as long as you want. You study at your pace, not ours. Students who satisfactorily complete the course are awarded the Diploma in Image Consulting. They receive the certificate that you can see on the right. Once you complete the image consulting course, we send information about your success to your local newspapers (if you want). It's a good way of telling potential clients that you're available. You'll also get this virtual sticker to use on your website, letters and brochures. It's hard to know whether the course will suit you. And you probably have lots of unanswered questions. If you call us on 0800 781 1715 in the UK, we'll try to answer your queries. But, you ask, does anyone actually claim a refund? Absolutely! Around five per cent of our students ask for their money back each month. And we're happy to pay them, because we know that the best course in the world won't suit every single person. Register now for the image consulting course by clicking here. If you need help or information, contact the Blackford Centre. E-mail or post the form and payment to us. Do the same for the other modules, until you reach the end of the course. By then, you'll be earning good money as an image consultant.